As some may know, I spent the entire month of April in Myanmar(Burma), on a solo trip, with my backpack. My main motivation for going there, was without a doubt, to see the country before it changes too much. I wanted to see this very different country, that seemed so shut off, compared to the rest of Asia. What I also wanted; was to do it myself. I wanted to deal with all the up’s and downs, of traveling around in this country, alone. If I had the most exciting experience ever, only I would be there to experience it. If everything went wrong, if I ended up getting depressed, there would be no one to turn to, but myself. The thought scared me. And more than anything, that fact made me certain; I had to do it. So what did I learn from going to this country and why was it so special? The thing about Myanmar is, that it is one of the first countries I have been to, for many many years, where your phone just does not work. Nothing about expensive rates or anything, it just won’t find a signal. I never use my phone that much, during my vacations, but being totally without the option to receive or send anything, sure is a different feeling. I had read that there probably wouldn’t be any wi-fi available at the hotels, but arriving at my first stop in Mandalay they had quite good wi-fi. I found myself using it, checking mail, checking facebook, the usual forums I am active on etc. whenever I had some downtime and waited for my next move. It sorta filled the void as those sites are extremely powerful at doing. 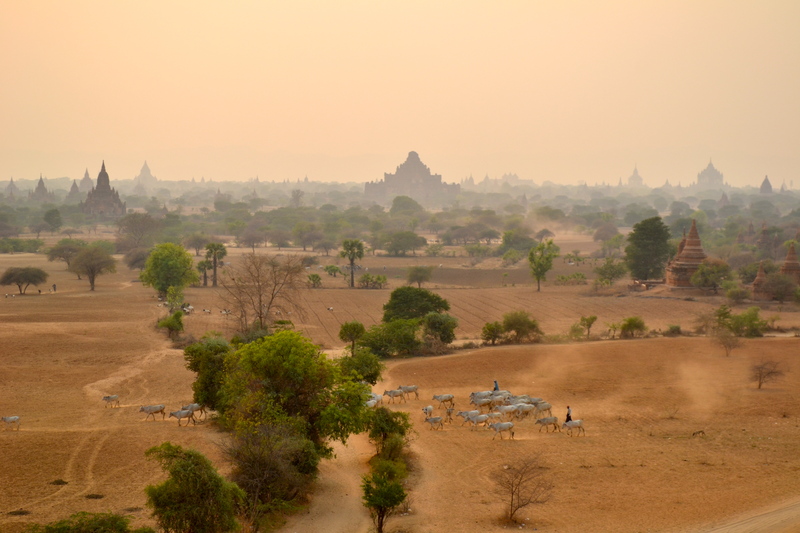 When I moved on from Mandalay and got to Bagan, luckily they didn’t have wifi, at the place I chose to stay. There were some cafées and restaurants that advertised with wifi, but rather early on, I made the decision to be disconnected. The reason for going alone in the first place, was to handle everything by myself – up’s and downs. If I filled the voids with distractions, then I would be sort of missing the point of the whole trip in the first place. But the decision seemed kind of intimidating. I had left rather quickly, only a handful of people really knew I had left, so quite a lot of people could be left without answers to emails, messages etc. Of course, rationally it should be quite obvious to everyone, that in 99.9% of cases, not answering will not be that big of a deal. Very few issues are irreversible and no matter what I ever tell myself; then I am not THAT important. But taking the decision did cause a variety of thoughts running through my mind. Now, how did being disconnected change my experience of each day. First thing, my fancy does-everything-iPhone suddenly saw itself deducted to a simple mp3-player. It dramatically decreased its use, but when you only use it for music, even though you hear a lot of music, the battery-life skyrockets. What also happens is that you start to be more aware of how you feel. When you remove the distractions that are always present to fill the times between activities, you are left with only your thoughts. When you no longer spend time reading emails, news etc. on your phone, you can be more aware of what happens around you. You notice more people, you notice what they are up to. You even become more aware of what you, yourself are up to, how you feel. Notice more of the surroundings, which always is a positive thing, but especially when you find yourself in a foreign country soaking up impressions. As a consequence you interact a lot more and therefore experience more. When you sit around a table, you suddenly have to talk to each other, if there is a sudden silence, no one grabs for their phones to check for updates, they just sit look at each other and then after a while, someone starts a new subject or continues the old. Conversation and thought, shared among people, gathered around a table – just as it should be. At one point, around halfway through my trip, I sat at a restaurant, where, what must have been some wealthy locals sat at a table. A mother and her two sons. From the second they sat down, they all had phones in their hands, not exchanging much more than a single word or two, but sometimes showing the others some things they had found on the phones. In probably most parts of the world, this wouldn’t stand out in any way. But here in this reality, you suddenly noticed how incredibly stupid it is to be out with friends or family and then focus your attention, on a stupid gadget, instead of the people right in front of you. When you don’t occupy your mind with stupid distractions, you are suddenly forced to think much more creatively. Focus your mind on creating new ideas, instead of just reacting to the stimulus you get bombarded with. When you’re not distracted, you think a lot more. You come up with ideas as to how you will spend your time, which activities you would actually like to do. You’re not being wound up in awe, over all the things other people experience, you think about what your options are right here, right now and then you act upon them. The really hard part about all this, is coming home and not just fall head first into the good old habits of checking mail, facebook, instagram, whatever all the time. But in my experience, once you have come aware of how stupid all this online-all-the-time is, you are more likely to leave your phone behind and just enjoy the moment. You know that the moment does not lose any significance just because you did not share it with the world. They might actually do the exact opposite. Previous Post What is beta alanine? The new creatine?